The usual derivation of the term Europe recalls the Greek myth of Europa. 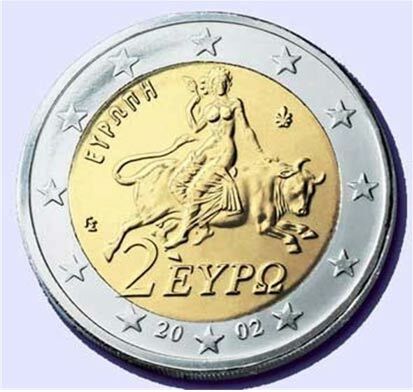 This origin is no mystery, in fact the Euro, their official coin, depicts the famous virgin seated on her bull-god. A popular etiology but, in my view, totally unsatisfying. A true origin cannot be traced to a myth. Surely, an actual event spawned the myth. Herodotus (450 BC.) suspected a truth behind it. He assumed Europa really lived but, her story was allegorical; the bull-god actually represented her Cretan kidnappers (Herodotus "Histories" Book 1. 2 ). However, it could be that the maiden was the allegory. We know that "Phoenicians" worshiped the bull-god "El." And at least one "Phoenician" nation really did use an allegorical "Virgin" as their symbolic figurehead. The “Virgin of Israel” ( Jeremiah 18:13 , Amos 5:2 ). Israelites commonly symbolized nations as virgins. Isaiah alludes to the "Virgin Daughter Sidon" (23:12), and the "Virgin Daughter Babylon" ( 47:1), Jeremiah uses ”O virgin, the daughter of Egypt” ( 46:11). European nations continue this practice today. Rome, founded by Romulus, has a figurative female personification called "Roma," Britain, founded by Brutus (its first king in the " Historia Britonum "), has Britannia, and America, a European colony discovered by Columbus, has its "Columbia." Conforming to the pattern, the founder of Israel’s Northern Ten Tribes was named "Jeroboam" (“yarobh`am”; The Septuagint has "Hieroboam," from; " International Standard Bible Encyclopedia ". 'JEROBOAM'".). "Europa" is a very plausible feminized Greek transliteration of his name (compare "Hieropolis," "Jerablus" and "Europos," all transliterations for the same alternate name for "Carchemish."). Furthermore, Greek mythology didn't use the term "Israel" and, neither do the Scriptures use "Phoenicia" although, both terms described the "land of Canaan." Israel was reckoned "from the river of Egypt unto the great river, the river Euphrates" ( Genesis 15:18 ), and specifically; "behold the land of Canaan, which I give unto the children of Israel for a possession" ( Deuteronomy 32:49 ). Consequently, the Greek “Phoenicia” could have included Israel, just as the Scriptural “Israel” encompassed Phoenicia. The Hebrews blamed Jeroboam for the loss of "The Virgin of Israel" (The Northern Ten Tribes) among the nations. He committed a famous sin (mentioned over 20 times in the Scriptures) – he promoted the adoration of God in bull form. “So the king took counsel and made two calves of gold. And he said '... Behold your gods, O Israel ...” ( 1Ki 12:28-30 ). "And the Lord ... tore Israel from the house of David, and they made Jeroboam ... king. Then Jeroboam drove Israel from following the Lord, and made them commit a great sin. For the children of Israel walked in all the sins of Jeroboam" ( 2Ki 17:20-22 ). God took credit for the removal of Northern Israel saying; ”this thing is from me.” ( 1Ki 12:24 ). “He will uproot Israel from this good land which He gave to their fathers, and will scatter them, ... because of the sins of Jeroboam” ( 1Ki 14:15,16 ). Therefore, Greek references to the "Maiden of Phoenicia" (as carried away adoring the bull-god and lost among the nations), by a feminized version of the name "Jeroboam," appears as a perfectly logical usage. 1.) God favors Jeroboam and personally intercedes to arrange for the ten tribes to secede from Judah ( 1Ki 11:30-38 ). 2.) There's an initial struggle between Judah and Israel over the possession of the "Virgin" ( 1Ki 12:21-24 ), until God steps in and decides the issue in favor of the separation. 3.) Jeroboam institutes the adoration of God in the form of a bullock ( 1Ki 12:28-30 ). 4.) The "Virgin" gets "carried away" ( 1Ch 5:26 ) and is lost, "scattered" amongst the nations ( Ezekiel 36:19 ). 5.) An heir to the throne (My servant David) is sent to "regather" her ( Isaiah 11:10-12 , Ezekiel 37:21-25 ). Jeremiah ( 31:21) implores her to come back home again; "... return, O virgin of Israel," and Ezekiel, "I’ll gather you from the nations and bring you back from the countries where you’ve been scattered," ( Ezekiel 11:17 ). 1.) Zeus saw Europa the daughter of Phoenix ... and fell in love with her. ( Scholiast on Homer, Il. xii. 292 ). "I had passion for Europa's embrace! With these words Zeus passed away in the shape of the horned Bull" ( Nonnus "Dionysiaca" Book 1. 408 ). 2.) "The maid Europa slept in her bower under the roof, she dreamt that two lands near and far strove with one another for the possession of her. Their guise was the guise of women, and the one had the look of an outland wife and the other was like to the dames of her own country. ... the outland woman laid violent hands upon her and haled her far away; nor went she altogether unwilling, for she that haled her said: “The Aegis-Bearer hath ordained thee to be mine.” ( Moschus "Europa" 8-15 ). 3.) " Jove laid aside his glorious dignity, for he assumed the semblance of a bull ... When she beheld his beauty and mild eyes, the daughter of Agenor was amazed." ( Ovid "Metamorphoses" 2. 846 ). 4.) 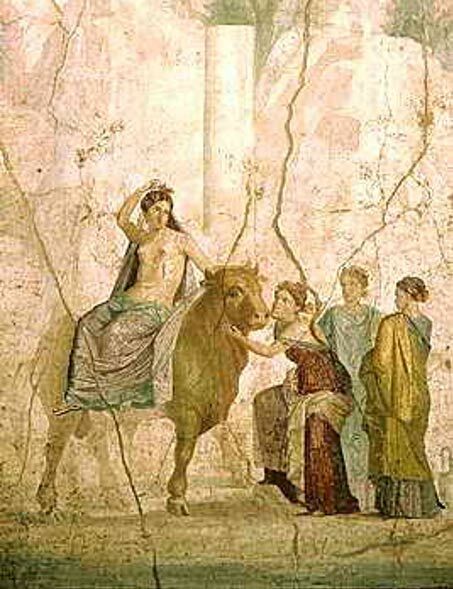 "Zeus loved her, and turning himself into a tame bull, he mounted her on his back and conveyed her through the sea" ( Apollodorus "Library" 3.1.1 ). 5.) "her father bade her brother Cadmus search through all the world, until he found his sister" ( Ovid, "Metamorphoses" Book 3.1 ). Coming next in Part 2: Is Europe connected to Israel’s Lost Ten Tribes? Phoenicia was lebanon. And israel is forcibly in palestine. Consider this quote from Herodotus; "but whence the several gods had their birth, or whether they all were from the beginning, and of what form they are, they did not learn till yesterday, as it were, or the day before: for Hesiod and Homer I suppose were four hundred years before my time and not more, and these are they who made a theogony for the Hellenes and gave the titles to the gods and distributed to them honours and arts, and set forth their forms: but the poets who are said to have been before these men were really in my opinion after them." ("The History of Herodotus" 2.53). Now Herodotus lived around 450 BC. And, by his best guess the origins of Greek mythology was no earlier that about 850 BC. 100 years after King Jeroboam had lived. However of the Greek mythographers, whose works have come down to us, were even more recent and, lived after 650 BC. Modern historians who believe that the "age of Greek Mythology" ran from about 1500 BC. Through about 1200 BC. Are relying on a hypothesized 500 year "Dark Age" for which they can cite no history, and of which the ancient historians make no mention. However most will admit that the myths were not "written" (The Alphabet, brought by Cadmus, himself a character from the Europa myth, has been dated to about 750 BC.) until after the Kingdom of Israel existed. 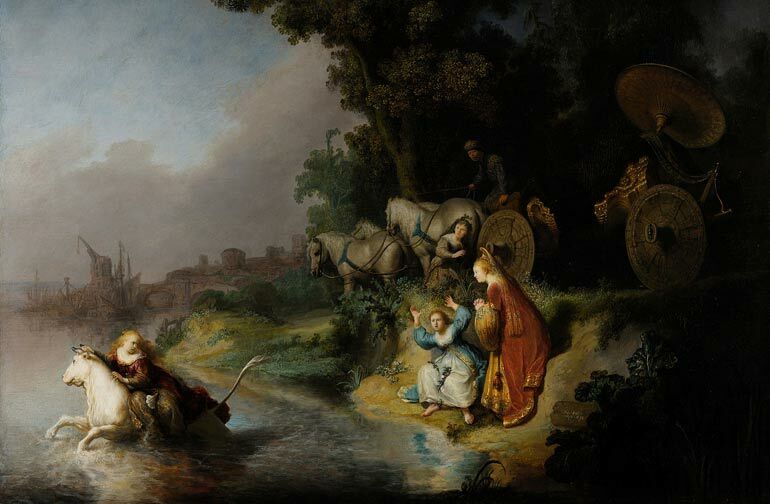 it certainly sounds like a valid hypothesis.. but does anyone have an accurate dating for the creation of these greek myths that keep being associated with biblical stories? if indeed the bible story came first then it would grant more validity.. like a previous article associating sampson n the foxes with canis major n minor and sampson himself with heracles.. but no mention is made of the DATES!